Whatever you are celebrating, Balloonatix is ready to take your event to the next level. We offer a wide range of balloon décor, from large arches, to incredible centerpieces that will bring your party to life! Whether you are decorating for a party, corporate event, wedding ceremony, picnic, Balloonatix is ready to be a part of your special occasion. We specialize in custom work, so if you are thinking of something different, we might just have that too! *We deliver within a 50 mile radius. I have used Balloonatix several times a year for probably the past 10 years. They have always arrived on time and have been the hit at every party regardless of the age of the guests! Franco is truly an artist and can make anything out of a balloon! I look forward to the next time he entertains our party at the end of this month. I can’t say enough positive things to describe how much I appreciate having this connection to liven up events! We hired Balloonatix Entertainment for our Cinco de Mayo event at The Phoenix Day School for the Deaf. Frank was great with our kids and the families. They absolutely loved the balloon creations that he made! Balloonatix has provided entertainment for numerous events at the Valley of the Sun Jewish Community Center. Not only do they provide the best entertainment for our campers, but they provide just as lighthearted fun for our parents! Aislinn Saputo, and her team, are always professional and willing to go the extra mile for a laugh. 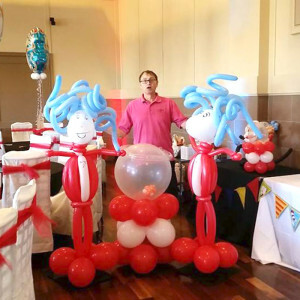 On a professional and personal level, I would recommend Balloonatix for all my events! Balloonatix is great!!! We hire them for every holiday. The artists are great with kids and the adults. They treat everyone with respect and kindness and we appreciate the professionalism. The guest and staff are always amazed at their works of art, which are awesome by the way. They can create anything you can imagine. I would recommend them for any event. Frank and Aislinn are AMAZING! The kids go crazy for them, and you will be totally amazed at the awesomeness that happens with the balloons. Elsa, Spider-Man, amazing butterflies and other animals. This was our entertainment and “party gift.” Everyone loved it! We hired Balloonatix for our daughter’s birthday and Franco was simply great. Great with all our guests and their kids. He’s incredibly patient and has a fantastic sense of humor. Oh, and he loves to spoil the heck out of the birthday kid! His rates are extremely reasonable. Want to throw a great party for your family? Invite Franco!